Photo: Marsha Vdovin for CDM. Remember when electronic sound gear hid in hulking, rack-sized cases? 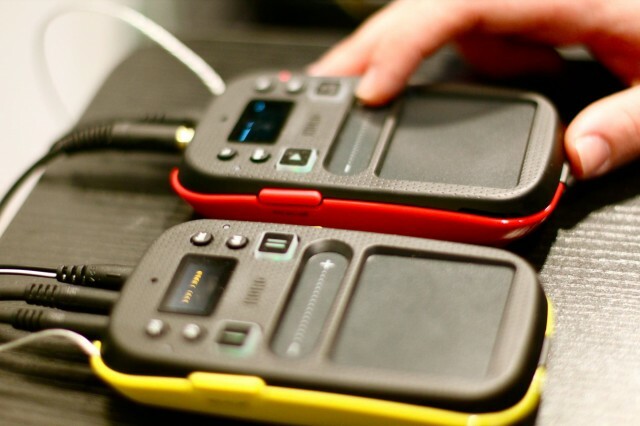 Korg’s Kaossilator series had already begun shrinking the desktop KAOSS Pad gear, but even the first-generation Kaossilator wouldn’t fit in your pocket, given its square shape and corners. (Well, unless you were wearing overalls.) The Kaossilator 2 and Mini Kaoss Pad 2, on the other hand, are scaled perfectly to your hand and would tuck neatly into a pocket in your pants or bag. And while I know some readers were hoping for a new Pro addition to the KAOSS line, these little bundles of joy have added some functionality that could make them musically useful. Being dedicated hardware, they also won’t suffer from a battery sapped by phone calls or the interruption of a Facebook message – and that input jack is built in. That crossfader, of course, is entirely new, and Korg does mention “dance music” in the sounds and focus. It’s easy, then, to imagine this as a pocket-able instrument for jamming or something you’d use to make musical ideas on the go, and it does look like a lot of fun. Now, it’s a little hard to imagine DJing on something the size of a deck of cards, but, of course, I hope somewhere out there tries. I like the idea of putting your tracks on there and improvising a little mix, especially with the ability to record. Again, you could use it as a little sketchpad. I got some hands-on time on the first morning of the show, and they’re a blast to play with, certainly. See the official Korg videos. The other advantage of dedicated hardware here is, again, having a dedicated resistive touch interface. On a phone, the highly-sensitive capacitive interface can lead to missed triggers, and you have to fiddle around with menus and the like. There is something to be said for this dedicated gadget, at least for some. And it seems worth comparing, since many of you have a smartphone. What do you think – are you intrigued at all by these latest Korg gadgets? With a US$160 street, if you are, they may be hard to resist. We’ll watch for when these start shipping.